Exciting times at Park Hill , David Campbell was interviewed by BBC Look North`s Tom Ingall along with Urban Splash`s Mark Latham. 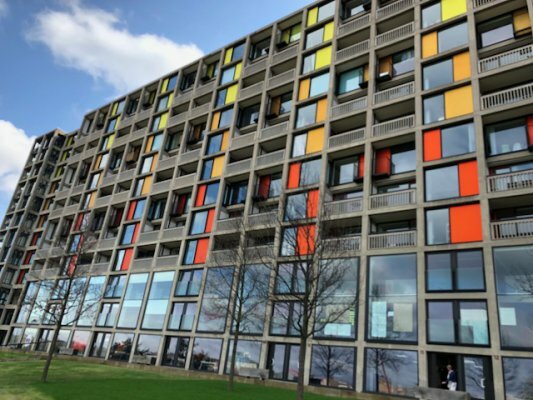 There is currently a lot going on around Park Hill including the new musical Standing at the Sky’s Edge – the fact that it has happened demonstrates how much Park Hill means to the people of Sheffield. David Campbell highlighted the fact that eventhough the architectural style of Park Hill may not be to everyones taste the students Alumno has spoken to are very enthusiastic about living in this iconic development. Wonderful to hear that current Park Hill resident Sue Payne is looking forward to seeing students living at Park Hill and hopes this will add to the vibrancy of the community there. The Alumno phase includes 356 student beds contained within a unique townhouse offer and with communal space interiors by Ben Kelly Design and Brinkworth Design.